The Sixers are going to have a long, hard discussion about whether to take Ingram or whether to take Simmons. I think you could go either way but right now, I lean towards them taking Ingram simply because their wing play is atrocious and they desperately need scoring. Also, Simmons plays a similar position to Dario Saric, who's expected to join the team next season. 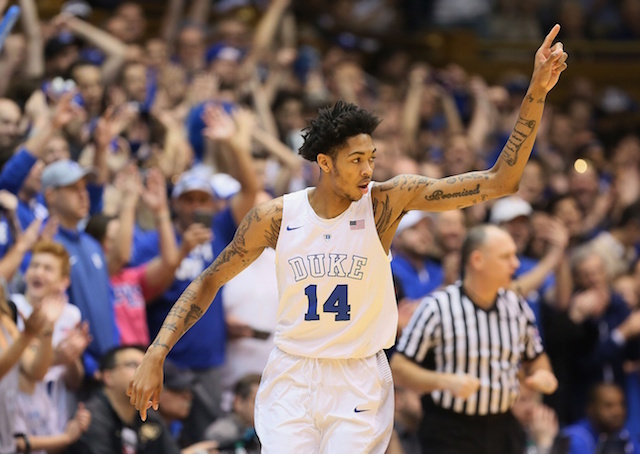 Ingram needs to get bigger and stronger but he is a terrific shooter and he has got the size and the length to be a very good defender. The fact that he got better over the course of his sole season in Durham certainly helps. Los Angeles is extraordinarily happy to keep their pick and thus they will have their choice of whichever player Philadelphia does not take. Whether or not the questions about his competitiveness and his attitude and his drive are overblown, his unique skill-set for a player of his size is very intriguing and are why many project him to be a star at the next level. He may not be the best shooter in the world but he more than makes up it with the awareness and the playmaking ability of a point guard and some impressive athleticism. Coming off their best season ever, being able to pick in the top ten is certainly a luxury for a franchise such as this. Therefore with a veteran roster, I think they could very well take a long-term prospect that could develop while they continue to win and Chriss would apply. He still is very raw, will probably need some seasoning in the D-League and had trouble staying out of foul trouble but he is a terrific athlete and showed some potential for a jumper with range out to the perimeter. I've been hearing some rumors out there that the Hawks are looking to possibly move Jeff Teague and thus move Dennis Schroeder into the starting lineup, which would create a need for a point guard coming off the bench. Baldwin may not be a natural point, although his size and length are intriguing for the position, but he is a very solid defender and is good at hitting shots from the outside and that is always welcomed on this team. The Hornets bounced back in a big way this season as they returned to the playoffs and a big reason why was much-improved shooting from the perimeter. That they were able to do with Al Jefferson suffering from injuries for a good chunk of the season was even more impressive but with Jefferson being a free agent, the team could look to get some insurance at the five. Stone is very talented but will he be able to adjust to the NBA game after an inconsistent season in College Park? That's why working with a good big men coach like Steve Clifford could be helpful.